The clubof.info Blog: Russian trolls or truth-tellers? Unable to accept that the Internet has given rise to new, alternative media voices, the mainstream media resorts to new lows in smearing bloggers as "trolls" and proponents of "propaganda". Worst of all is the suggestion that everyone criticizing the media's anti-Russian lies is being paid by the Russians. Apparently, the solution to the truth and the bloggers who help to convey it against the tide of lies of the mainstream media is some dirty mound of money, and lots of it. Think of that paradox for a moment. On the side of the “dictator” Putin, there are grassroots bloggers all being rejected as “fake” by Western governments and “respected” journalists. Putin is called “plutocratic” by these liars, who came to office powered by corporate donors and who believe their dirty money is the “democratic” way to resist Putin “propaganda” emanating from (what looks like??) genuine, grassroots bloggers telling the truth about Ukraine. I guess that when you have no popular support on the blogosphere, all you can do is fabricate something or use the bullhorns of corporate media, and that’s where the billions of dollars spent on getting America’s message out to the world is going to go – towards countering the “propaganda” of millions of Internet users who are sick and tired of lies being stuffed down their throats and would prefer to examine the facts according to their own interests. The blog makes the observation that a "new McCarthyism" (a logical consequence of the "new Cold War") is motivating politicians and journalists to condemn any blogger opposing their anti-Russian partisanship as somehow paid or manipulated by Vladimir Putin. McCarthyism was a phenomenon during the original Cold War, in which artists and media figures were accused of being the direct agents of Joseph Stalin or later Soviet leaders due to their criticisms of US policy. McCarthyism is viewed by historians as a form of political persecution and censorship at best, and a witch-hunt at worst. While claims are being made that Russia is winning an "information war", using propaganda, the reality is simply that the Russians are right and the Americans are wrong. Not only is the US itself supporting foreign rebel groups as it accuses Russia of doing in Ukraine, but it is still waging a war of aggression against five countries. 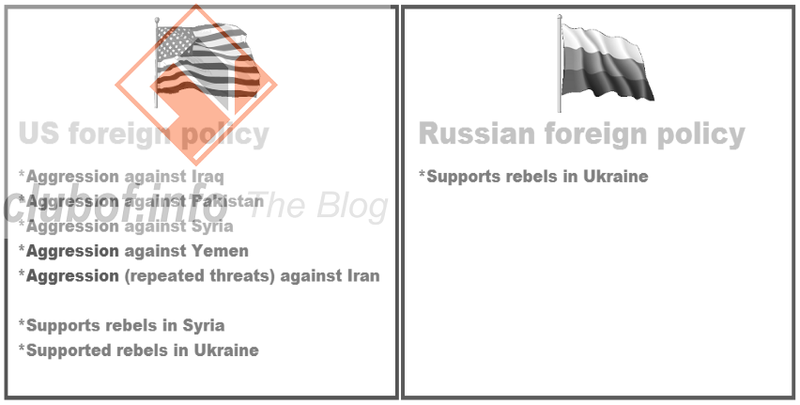 These are listed at the L'Ordre blog as Yemen, Iraq, Pakistan, Syria, and Iran - the latter being subjected to threats of aggression that are prohibited under international law by the same article outlawing unprovoked military attack on other UN member states.